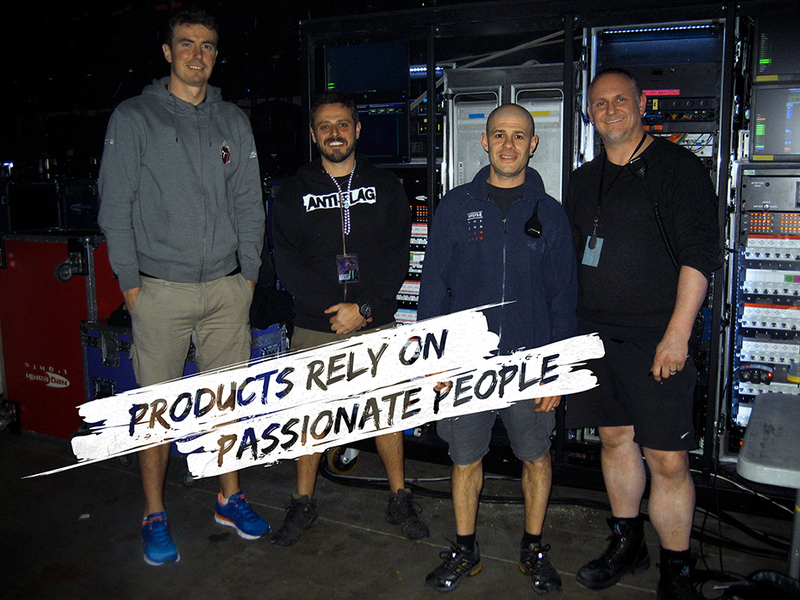 Two weeks into Robbie Williams’, Swings Both Ways Tour, we caught up with some of the lighting crew members from NEG EARTH to hear about their jobs, their lives and their experience of touring and working behind the scenes on a major production. We got talking to Lighting Electrician, Peter ‘Kiss’ Horne and Lighting Technicians, Davide Palumbi, Mike Maslen and Alessandro Schillaci. Different circumstances got them to where they are today. Davide had done a bit of lighting in his native Italy, fell in love with a Brit and came over to the UK and applied to work for NEG EARTH. Kiss was originally supposed to study civil engineering, but got involved with the stage crew at his university. Alessandro, also an Italian, and Australian Mike both worked with local crews in their home countries and both aspired to eventually work for NEG EARTH, as NEG EARTH is known for working with the very best equipment. Life on the road is not for the faint-hearted. It can be tough to be away from family and loved ones for long periods of time. Therefore, according to Alessandro: “To thrive in this job, it is very important to have good people around you; to feel part of a family.” There isn’t much privacy with 12-16 people on a tour bus, and so it is imperative with mutual respect and an understanding of each other’s boundaries and that there’s room for individuality and personal quirks and traits. There’s a real sense of team spirit among the crew and most of them go way back. The lighting crew and half the video crew have been working together since 2009 when they were on tour with Muse, then with Take That, then with Muse again and now with Robbie Williams. So when started it didn’t take long before everything was running like a well-oiled machine, before everyone had found their place and work routines were fully optimized. When we asked the crew what their best piece of advice would be to people wanting to get into the industry, their answers were unanimous: “Get a degree first, so you have something to fall back on”! As they explained it, chances are that touring life won’t suit you forever, but then again, some people can’t stay away from it once they’ve had a taste! Some people even swear that they would jump at the chance to stop touring but at the end of the day, touring becomes a way of life and it becomes part of who you are. It’s easier said than done to opt out and leave the touring life behind. Although the quality of light is not this crew’s priority, they are able to appreciate the MAC Quantum for it’s sublime lighting qualities. Especially compared to older LED fixtures, where the individual RGBs were visible, the front of the Quantum looks nice with its converged light source. Commenting on the headline of this piece, Kiss said: “I must say that none of us think of ourselves as stars - we’re just the crew behind the backdrop”. Respectfully disagreeing, we decided to leave the title as it is, acknowledging that there would be no rockstars without crew, just as there would be no show without lighting.